The Oakley Airwave is now one of my favourite tech toys! The Oakley Airwave is now one of my favourite tech toys! It is clearly still early days for what is possible with the product, so there is the usual early adopter hassle factor with some of the features and especially the online software. But I am sure all of that will improve rapidly. I could not wait to get my hands on the MOD Live HUD from Recon once I got to Canada, but I was not sure if they would fit into my goggles. 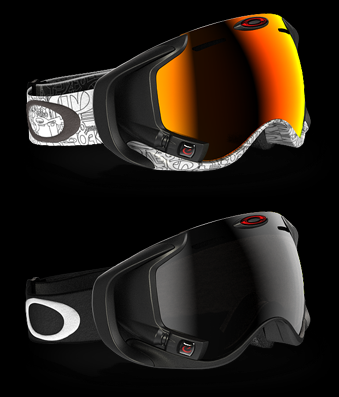 Then just before we arrived in Fernie, Oakley launched the Oakley Airwave with built in MOD Live HUD. So the only thing I HAD to get for myself in Calgary was the Oakley Airwave goggles. From online reports it sounded like I would be able to get the Oakley Airwave goggles at an Apple store. So I made sure we got to the closest Apple Store, even with the kids being extremely tired from the jetlag. The Apple Store was in a big mall, so while the kids slept in the car I raced inside. Walking towards the Apple store I noticed that there was an Oakley Store upstairs. When the Apple Store did not have the Oakley Airwave goggles, I went round to the Oakley Store. Luckily they still had some left, the Gunmetal with Black Iridium lens was sold out but they still had White Factory Text with Fire Iridium lens. – The heads up display worked perfectly for me, I love checking the starts after every run and the max stats served as motivation for me and a mate to have a race. – It is just so cool! The goggles look awesome and the Iridium lenses remind me of fighter pilot lenses. – Uploading the data to the web based software is very easy. – The lenses are interchangeable so you can change them for varying conditions. (You have to buy the other lenses separately). – The apps are great. I have a Contour GPS camera, it connects through Bluetooth to the Oakley Airwave. This allows you to see what the camera is recording on the Heads up Display. – Unlike endomondo the software both on the goggles and online knows when you are on a lift and when you are skiing. So the data only records when actually skiing. – It connects to Android and iPhone (only 4S or 5). The latest update for the iPhone app also allows you to control music, read text and see caller ID on the Heads up Display (same for android). – Battery life – like most first versions of hardware the battery life is not all that great. I have had to turn the brightness down and turn the display off at times to conserve the battery. – I use endomondo with a heart rate monitor when doing other sports, so I love having the heart rate stats and more accurate calorie count. Although you can buy a polar heart rate monitor that will allow you to see your heart rate at any one time on the Heads up Display. This data is not recorded. Bummer. – Engage the online software is still very elementary. It only gives you the run data and displays it on a map. No aggregate data or any other manipulation is given. They can learn allot from endomondo on what to do with all this rich data. – Like endomondo there are also some discrepancies with the data on the device and once it is uploaded. One example is that the device measures jumps in time and online shows it in distance, I can’t seem to find a way for this to correspond. I have read some complaints online about the loss of peripheral vision with the goggles, but that is not a problem for me at all. They actually align perfectly with my helmet and I have not noticed any change in peripheral vision. Overall the Oakley Airwave is one amazing tech and ski toy! There are some drawbacks, but I am sure with software updates and iterations on the hardware this is going to get better and better. As if I needed any more reason to get onto my skis. This entry was posted in Reviews, Tech Toys on 2013/01/09 by Justinus.